We have known for some time that Go is more popular in China than in any other country. According to Google Trends, most searches for the term “golang” come from The People’s Republic than anywhere else. Others have speculated on the same observation, yet so far we have had sparse concrete information about the phenomenon. 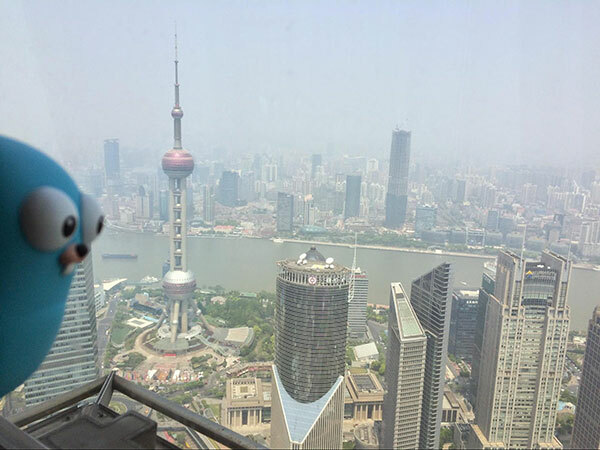 The first Go conference in China, GopherChina, seemed like an excellent opportunity to explore the situation by putting some Western Gopher feet on Chinese ground. An actual invitation made it real and I decided to accept and give a presentation about gofmt’s impact on software development. The conference took place over an April weekend in Shanghai, in the Puruan Building of the Shanghai Pudong Software Park, easily reachable by subway within an hour or less from Shanghai’s more central parts. Modelled after GopherCon, the conference was single-track, with all talks presented in a conference room that fit about 400 attendees. 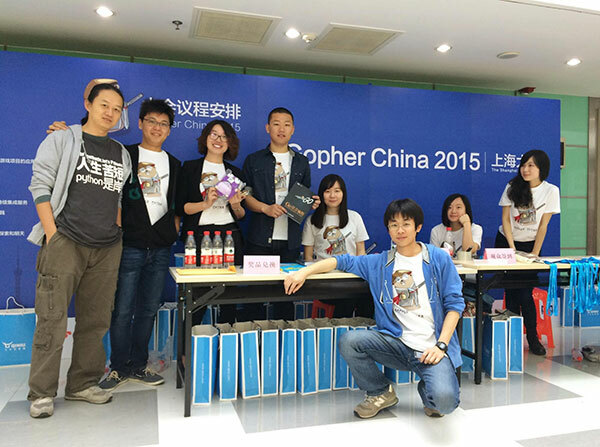 It was organized by volunteers, lead by Asta Xie, and with robust sponsorship from major industry names. According to the organizers, many more people were hoping to attend than could be accommodated due to space constraints. The welcoming committee with Asta Xie (2nd from left), the primary organizer. Each attendee received a bag filled with the obligatory GopherChina t-shirt, various sponsor-related informational brochures, stickers, and the occasional stuffed “something” (no fluffy Gophers, though). At least one 3rd party vendor was advertising technical books, including several original (not translated from English) Go books. On first impression, the average attendee seemed pretty young, which made for an enthusiastic crowd, and the event appeared well run. With the exception of my talk, all presentations were given in Mandarin and thus were incomprehensible to me. Asta Xie, the primary organizer, assisted with a few simultaneous translations whispered into my ear, and the occasional English slide provided additional clues: “69GB” stands out even without any Mandarin knowledge (more on that below). Consequently, I ended up listening to a handful of presentations only, and instead spent much of my time talking with attendees outside the main conference room. Yet judging from the slides, the quality of most presentations seemed high, comparable with our experience at GopherCon in Denver last year. Each talk got a one hour time slot which allowed for plenty of technical detail, and many (dozens) of questions from an enthusiastic audience. As expected, many of the presentations were about web services, backends for mobile applications, and so on. Some of the systems appear to be huge by any measure. For instance, a talk by Yang Zhou described a large-scale internal messaging system, used by Qihoo 360, a major Chinese software firm, all written in Go. The presentation discussed how his team managed to reduce an original heap size of 69GB (!) and the resulting long GC pauses of 3-6s to more manageable numbers, and how they run millions of goroutines per machine, on a fleet of thousands of machines. A future guest blog post is planned describing this system in more detail. Packed conference room on Saturday. In another presentation, Feng Guo from DaoCloud talked about how they use Go in their company for what they call the “continuous delivery” of applications. DaoCloud takes care of automatically moving software hosted on GitHub (and Chinese equivalents) to the cloud. A software developer simply pushes a new version on GitHub and DaoCloud takes care of the rest: running tests, Dockerizing it, and shipping it using your preferred cloud service provider. Several speakers were from well-recognized major software firms (I showed the conference program to non-technical people and they easily recognized several of the firm’s names). Much more so than in the US, it seems Go is not just hugely popular with newcomers and startups, but has very much found its way into larger organizations and is employed at a scale that we are only starting to see elsewhere. Not being an expert in web services myself, in my presentation I veered off the general conference theme a bit by talking about gofmt and how its widespread use has started to shape expectations not just for Go but other languages as well. I presented in English but had my slides translated to Mandarin beforehand. Due to the significant language barrier I wasn’t expecting too many questions on my talk itself. Instead I decided the keep it short and leave plenty of time for general questions on Go, which the audience appreciated. 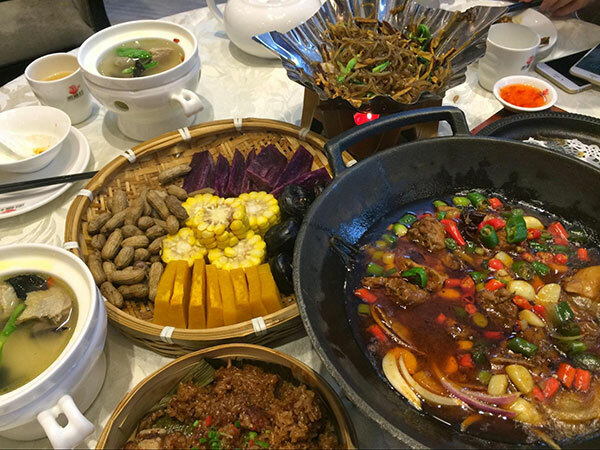 No social event in China is complete without fantastic food. 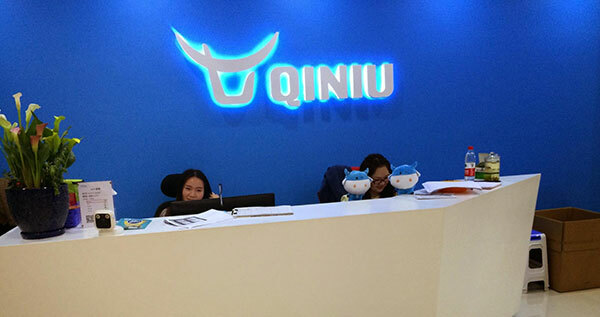 A couple of days after the conference I visited the 4-year-old startup company Qiniu (“Seven Bulls”), at the invitation of its CEO Wei Hsu, facilitated and translated with the help of Asta Xie. 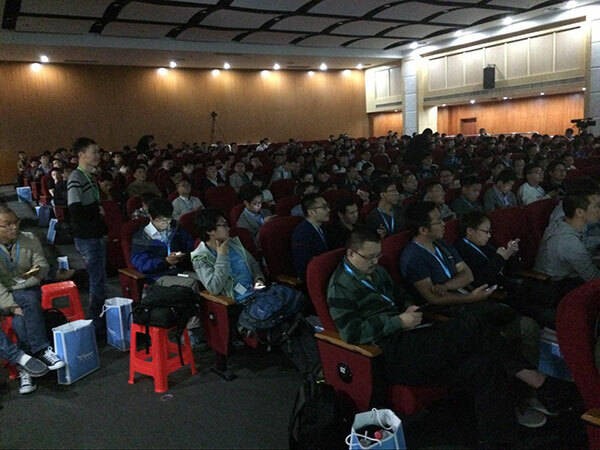 Qiniu is a cloud-based storage provider for mobile applications; Wei Hsu presented at the conference and also happens to be the author of one of the first Chinese books on Go (the leftmost one in the picture above). 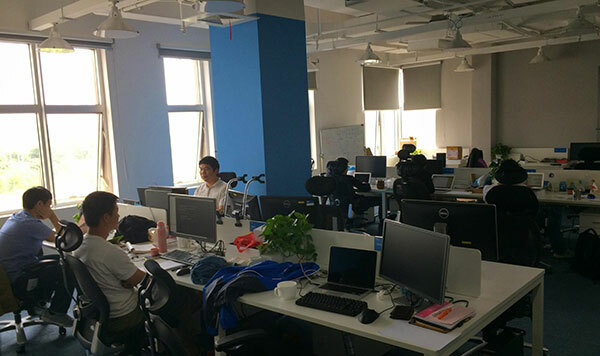 Qiniu is an extremely successful all-Go shop, with about 160 employees, serving over 150,000 companies and developers, storing over 50 Billion files, and growing by over 500 Million files per day. When asked about the reasons for Go’s success in China, Wei Hsu is quick to answer: PHP is extremely popular in China, but relatively slow and not well-suited for large systems. Like in the US, universities teach C++ and Java as primary languages, but for many applications C++ is too complex a tool and Java too bulky. In his opinion, Go now plays the role that traditionally belonged to PHP, but Go runs much faster, is type safe, and scales more easily. He loves the fact that Go is simple and applications are easy to deploy. He thought the language to be “perfect” for them and his primary request was for a recommended or even standardized package to easily access database systems. He did mention that they had GC problems in the past but were able to work around them. Hopefully our upcoming 1.5 release will address this. For Qiniu, Go appeared just at the right time and the right (open source) place. According to Asta Xie, Qiniu is just one of many Go shops in the PRC. Large companies such as Alibaba, Baidu, Tencent, and Weibo, are now all using Go in one form or another. He pointed out that while Shanghai and neighboring cities like Suzhou are high-tech centres, even more software developers are found in the Beijing area. For 2016, Asta hopes to organize a larger (1000, perhaps 1500 people) successor conference in Beijing. It appears that we have found the Go users in China: They are everywhere! Some of the GopherChina materials, including videos, are now available alongside Go coursework on a 3rd party site.